NEW: "I thought things were coming to an end"
Editor's Note: Read live blogging of the Japan tsunami and earthquake. Are you there? Send your video, pictures to iReport. Tokyo (CNN) -- The morning after Japan was struck by the most powerful earthquake to hit the island nation in recorded history and the tsunami it unleashed -- and even as the earth continued to twitch with aftershocks -- the disaster's massive impact was only beginning to be revealed. Rescue efforts began with the first light as military helicopters plucked survivors from roofs and carried them to safety. 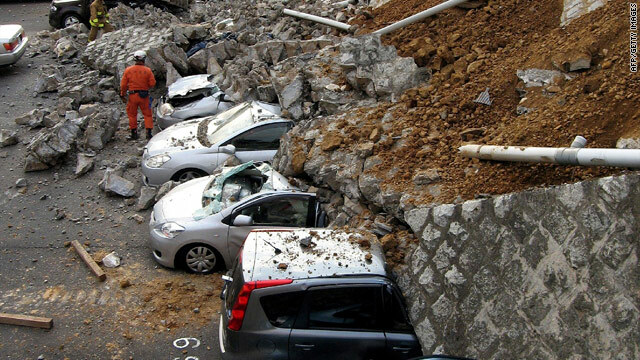 The 8.9-magnitude temblor, which was centered near the east coast of Japan, killed hundreds of people, caused the formation of 30-foot walls of water that swept across rice fields, engulfed entire towns, dragged houses onto highways, and tossed cars and boats like toys. Some waves reached six miles (10 kilometers) inland in Miyagi Prefecture on Japan's east coast. "The earth shook with such ferocity," said Andy Clark, who said he had gotten used to earthquakes during his 20 years in Japan but never experienced what he felt Friday at the airport outside Tokyo. "I thought things were coming to an end ... it was simply terrifying." Buildings shook, heaved and collapsed by the score, and numerous fires ignited. Hundreds more people were missing, Japanese media reported, citing local and national police. Tens of thousands of people were displaced, according to Japan's Kyodo News Agency. Prime Minister Naoto Kan said the "enormously powerful" earthquake had caused "tremendous damage over a wide area." The quake, which struck at 2:46 p.m. (12:46 a.m. ET), prompted the U.S. National Weather Service to issue tsunami warnings for at least 50 countries and territories. The epicenter of Friday's main quake was located off Miyagi Prefecture, about 230 miles (370 kilometers) northeast of Tokyo, the U.S. Geological Survey said. Also in Miyagi, officials reported that a train had derailed and authorities had lost contact with four trains in coastal areas, Kyodo reported, citing the East Japan Railway Company. Six million households, more than 10% of the total in Japan, were without electricity, said Japan's ambassador to the United States, Ichiro Fujisaki. In Tokyo, rail service was suspended overnight, elevated highways were shut early Saturday and surface streets remained jammed as commuters -- thousands of whom had spent the night in shelters -- tried to get to their homes in outlying areas. Video aired by Japanese broadcaster NHK showed extensive fires in Miyagi and in the port city of Hakodate, in the southern part of Hokkaido island in northern Japan. An oil refinery was burning in Chiba Prefecture near Tokyo, according to NHK. And Kyodo News said fires could be seen in extensive areas of Kesennuma in Miyagi. Aerial views of Kesennuma showed plumes of white smoke emanating from the center of the city and large, black areas the flames had already traversed. In the city of Minamisoma in Fukushima Prefecture, all that was left of many structures were their foundations. Only concrete and steel buildings appeared to have withstood the wash. No people were visible in the streets of the town, whose population on Friday had been 70,000. And a dam in Fukushima Prefecture failed, washing away homes, Kyodo reported. There was no immediate word of casualties, but the Defense Ministry said 1,800 homes were destroyed. The National Weather Service sent a warning to 50 countries and territories it said could be affected by the tsunami. Scores of aftershocks jarred the country Saturday, punctuated by a pair of strong earthquakes in the early morning, including one with a magnitude of 7.1 and another with a magnitude of 6.8. A leak occurred in an atomic power plant in northeast Japan, a spokesman for Japan's nuclear agency said Saturday. Cooling equipment stopped working when generators failed in the quake, and the temperature inside the plant in the Fukushima prefecture had risen; officials lowered the pressure inside the plant hangar by venting it, said spokesman Kazuo Kodama. But high levels of radiation led officials to suspend the release, NHK said. Alternative plans were being evaluated, the broadcaster said. Citing Japan's nuclear safety agency, Kyodo said radiation levels were 1,000 times above normal in the the control room of the facility's reactor. An evacuation order was extended to people who live within 10 kilometers (6 miles) of the plant, named Fukushima Daiichi, about 160 miles (260 kilometers) north of Tokyo. The agency said the radiation amount posed no immediate threat to the health of nearby residents, Kyodo reported. Cooling problems also appeared to have affected to another of the Tokyo Electric Power Company's nuclear facilities. Kyodo reported the power company alerted authorities that the cooling system at three units of another plant in the same prefecture. That prompted Japanese authorities to add that plant to its emergency list, along with the another plant, Kyodo said. Prime Minister Kan inspected the plant and the rest of the affected region from a helicopter. The government ordered the evacuation of residents nearest the plant as efforts to keep it cool after it was shut were initially hampered. Japanese public broadcaster NHK reported Saturday that the death toll is more than 900, with about 700 others reported missing. Earlier Saturday the nation's Kyodo News News Agency, citing police, reported that the death toll was 433, with at least 784 missing. The official death toll is likely to rise as authorities continue rescue and relief efforts in the worst-hit areas. Kyodo predicted the death toll would surpass 1,000. The news agency, citing Japan's defense forces, also said 60,000 to 70,000 people were being evacuated to shelters in the Sendai area of Miyagi Prefecture. The prime minister said an emergency task force had been activated, and he appealed for calm. The government dispatched 8,000 troops to assist in the recovery effort and asked for U.S. military assistance, according to Kyodo. By early Saturday, more than 50 countries had offered help, said Japan's Ministry of Foreign Affairs. U.S. President Barack Obama offered his condolences and said the United States was standing by to help "in this time of great trial." The U.S. Navy initiated reconnaissance flights to map the disaster zone and was moving the aircraft carrier USS Ronald Reagan into position to assist the Japanese government with relief efforts, defense officials said. Images from Japanese media and CNN iReporters showed smoke pouring from buildings and water rushing across fields, carrying away entire structures. "I wasn't scared when it started ... but it just kept going and going," said Michelle Roberts, who lives in central Tokyo. "I won't lie, it was quite scary. But we are all OK. We live on the third floor, so most everything shook and shifted." The quake toppled cars off bridges and into waters underneath. Waves of debris flowed like lava across farmland, pushing boats, houses and trailers in their paths. The quake also disrupted rail service and affected air travel. Hundreds of flights were canceled, Kyodo said. Some 13,000 people were stranded at the Narita airport, and 10,000 were stuck at the Haneda airport, the news agency said. Flights into and out of both airports had resumed Saturday. At Tokyo Station, one of Japan's busiest subway terminals, shaken commuters grabbed one another to stay steady as the ground shook. Dazed residents poured into the streets, and offices and schools were closed. Children cried. "This was larger than anyone expected and went on longer than anyone expected," said Matt Alt, who lives in Tokyo. "My wife was the calm one. ... She told us to get down and put your back on something, and leave the windows and doors open in case a building shifts so you don't get trapped." The magnitude of the earthquake and its shallow depth -- 15.2 miles (24.5 kilometers) -- created a lot of energy, said Shenza Chen of the U.S. Geological Survey. The impact was felt far and wide. In McKinleyville, California, a wave swept three men into the Pacific Ocean as they were reportedly trying to take photos of the incoming tsunami waves, according to the U.S. Coast Guard. Two of the men returned to shore, but one died, officials said. Japanese government officials said large tsunami waves were still a risk to coastal Japan, and they urged residents in coastal areas to move to higher ground. The tsunami brought waves of nearly 7 feet to a harbor in Maui, authorities said, but other areas reported lower levels. On the U.S. mainland, wave heights from Alaska to California ranged from less than a foot to more than 8 feet. The highest measurement, 8.1 feet, was at Crescent City, California. Tsunamis are a series of long ocean waves that can last five to 15 minutes and cause extensive flooding in coastal areas. Sometimes, the waves hit in succession -- often the highest not being the first, CNN meteorologist Ivan Cabrera said. Humanitarian agencies were working with rescue crews to reach people affected by the earthquake and tsunami. "When such an earthquake impacts a developed country like Japan, our concern also turns to countries like the Philippines and Indonesia, which might not have the same resources," said Rachel Wolff, a spokeswoman for World Vision. Wolff said her agency is helping people in Japan and teaming up to help others in countries along the path of the tsunami. The quake was the latest in a series around Japan this week. On Wednesday, a 7.2-magnitude earthquake struck off the coast of Honshu, the country's meteorological agency said. Early Thursday, an earthquake with a preliminary magnitude of 6.3 struck off the same coast. 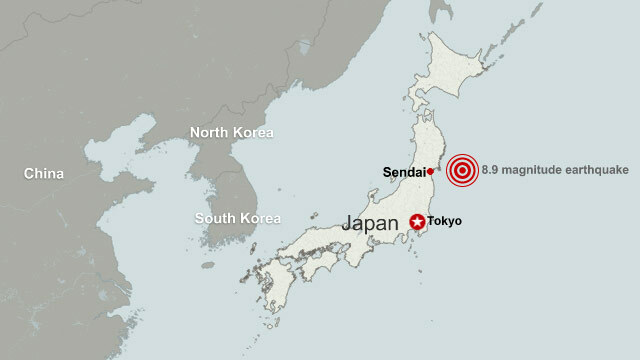 Friday's quake is the strongest earthquake in recorded history to hit Japan, according to U.S. Geologic Survey records. The previous record was an 8.6-magnitude earthquake that struck near the Chubu Region near southwestern Honshu on October 28, 1707, that may have killed 5,000 people, CNN meteorologist Sean Morris said. That quake generated a 33-foot (10-meter) tsunami wave, and some scientists believe the quake may have triggered the eruption of Mount Fuji 49 days later, Morris said. The world's largest recorded quake took place in Chile on May 22, 1960, with a magnitude of 9.5, the USGS said. CNN's Kyung Lah, Faith Karimi, Ed Payne, Catherine E. Shoichet, Kevin Voigt and Sean Morris contributed to this report.